Week 33 is now over and there are only 1 week and 5 days left salmon fishing in season 2018. Last week started like the week 32 ended. Water temperature was around 14 degrees, conditions were superb, salmon active and weathers fine. It lasted until Wednesday evening. 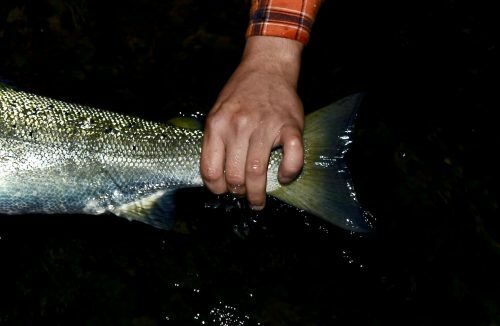 On Thursday heavy winds started to blow from South and the whole Weekend fishing weathers were very difficult, since it was a big challenge to get even downstream with the boat. For the fly fishing it wasn’t much easier either. Even though winds were hard, fishing continued to be very good. Almost 20 salmon were landed again by our guests from the home pool. week didn’t produce over 100 cm fish this time, but there were many fish between 80-95 cm and lots of grilse running still too. Most of the fish last week were caught by the boat but there were fly guiding as well. Our Austrian friends Andy, Andreas and Severin continued their amazing week. Andy managed to caught his first fly salmon ever and Severin lost two big ones with fly rod. In the early week we had two young guys from Turku, Ville and Joonas Virtanen. They were lucky enough to get guiding from our Camp Manager Petri. Evening ended in a great way with two beautiful fish bigger being female over 90 cm. Weekend saw two lucky beginners as well. On Saturday Keijo took a few hours boat guiding and it was sweetly rewarded with handsome cockfish around 90 cm. On Sunday old friend Matti brought his son to salmon fishing. Guided boat tour ended this time with great battle against 92 cm male fish. It took at home pool nearby boat place and after few great runs and very acrobatic leaps it was netted by our guide Miska. Water level raised 20 cm during the week, but raise was so slow that there weren’t much grass moving at river. New fishing week is just about to start. Water temperature is around 14 and conditions are great. Let’s see what new week brings in! 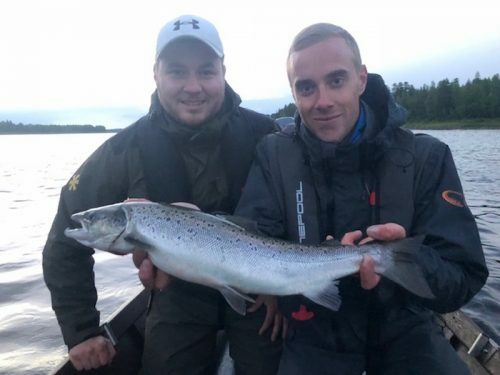 Joonas and Ville with their first salmon ever! Tail of beautiful fresh salmon.